We will participate in the live webcast of the long life puja that will be offered to Lama Zopa Rinpoche at Amitabha Buddhist Centre in Singapore. During the long life puja Rinpoche will be requested to give teachings on lojong (thought transformation). These teachings and the long life puja will be webcast live on FPMT’s Livestream page so that all can participate live or by video later. 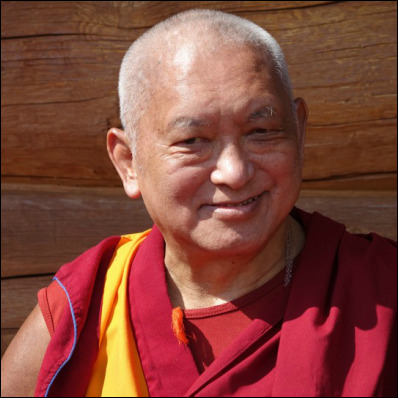 Lama Zopa Rinpoche, Buddha Amitabha Pure Land, Washington, US, August 2014. Photo by Ven. Roger Kunsang. In talking with Rinpoche recently it has become more clear regarding the importance of this long life puja we are having in Singapore at Amitabha Buddhist Centre on March 13. Rinpoche has been quite subtle, but has indicated that there are obstacles for himself this year. Rinpoche also said recently that one of the main things that will help is this long life puja in Singapore with all the FPMT centers and students participating, and prior to the puja, the 100,000 tsog offerings – this was advised by Khadro-la (Rangjung Neljorma Khadro Namsel Drolma). Please try to be at the long life puja or participate at a distance wherever you are. We have to continue to create the karma for Rinpoche to be with us for a long time and to purify our karma for Rinpoche not to be here. It is in our hands. FPMT – so many students around the world – have done so much to benefit others under Rinpoche’s patient and compassionate guidance, as well as under Lama Yeshe’s compassionate guidance. We need Rinpoche to live a very long and healthy life so we can continue to benefit sentient beings as much as possible.